To get ahead in the business world, you need to market. You can promote your business in many ways, but none are more effective than word of mouth. This is knows as referral marketing, and it is the most powerful tool available to your company. There are a great number of ways to promote referrals, but they are not all effective. The ultimate goal is to separate the tactics that work from those that don’t. This is why Andy Sernovitz wrote his book: Word of Mouth Marketing: How Smart Companies Get People Talking. In his book, Andy lays out key concepts related to creating an effective system. This process will help you get more repeat business and increase customer satisfaction. To do so, Andy outlines his “5 Ts”. Talkers are the people who will be telling their friends about your business. They are important to identify because they help you focus on an audience for your marketing. In order to find these people, look at your customers, local bloggers, or fans of your company. Then give them something to talk about. Topics are the reasons people would be talking about your company. 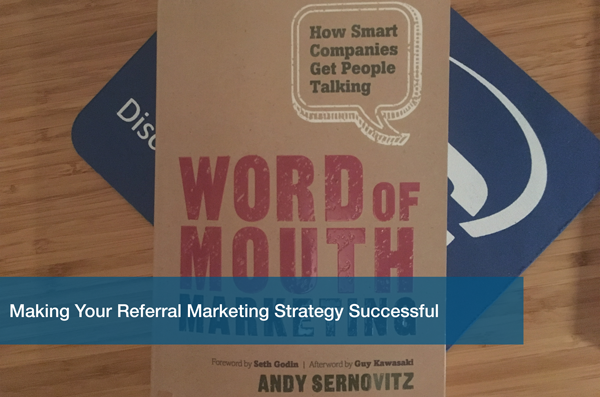 Referrals rely on your business providing talkers with something to tell their friends. Customer service is the most important thing when trying to build a network of referrals. It isn’t the only thing to focus on, though. Customers also like to tell their friends about special offers or sales, so promoting one may help your referrals go up. A word of mouth marketing campaign lets your customers become your marketing team. In order for them to be effective, you need to provide them with the proper tools. Some companies like to use a referral page on their website, while others like to hand out coupons. Whichever tools you choose, make sure they’re provided to customers. While not all reviews will be good, you need to show that you care about their experience with your company. The best way to do this is to respond to their review. Don’t limit your responses to angry clients, though. IT’s important to show appreciation for the people that leave you good reviews as well. Showing people that you care about their experience with your company will entice them to come back. You can also join in on discussions about your business. The important thing is for people to notice that you’re involved. Make sure you are measuring what’s working and what isn’t. Continuing to market in ways that are not effective will only waste your time. To track your numbers, you can use fancy measurement tools like the one Hootsuite offers. Or you can go the old-fashioned route and listen to the feedback. You can read blogs and posts about your company online to see the kind of reception you are getting. Proper tracking will allow you to develop a strategy that’ll skyrocket your business. Andy’s book offers valuable insight into the world of marketing. Using his 5 Ts, you can create a powerful marketing strategy that will make your company soar. Learn more on how your favorite Austin IT Support company uses referral marketing to build its client base by joining the discussion on our Facebook page. Share with us on social media on how you currently use referral marketing to build your business too!